The mandate of a medical school is the triple mandate of education, research and clinical care, all supported by adequate resources, engaged partners and effective administration. Still, occasionally, I hear that we are a small medical school and we cannot be expected to do it all, so why should we be trying to do (or grow) research? Simple explanations—like our curriculum needs to be supported by biomedical scientists whose entire careers are devoted to research; or that UGME and PGME accreditation require that education be in an environment where research takes place; and learners must have the opportunity to participate in research—are not always convincing to politicians, hospital administrators running a deficit, or even some of our clinical colleagues. Researchers I have known are motivated by an insatiable curiosity, a passion for research itself and a huge ambition to make that discovery that changes everything (or at least, saves lives or improves the lives of many)! Learners want to participate in research to maybe one day become a researcher or to enhance their CV in ways that will open other doors. Deans and university leaders want to see rankings improve and reputations grow. Unfortunately, not all are swayed by these arguments for growing biomedical, clinical and population health research. In medical schools there is a widespread belief that both education and research improve the quality of care and, thus, health outcomes. At the macro level, that is obvious. Though the greatest reductions in mortality over the last 150 years have been from population interventions like sanitation, clean water, improved nutrition and vaccines, all of these were due to research. However, in the last 30 years our country has seen a steady decline in the national rate of avoidable mortality from 373/100,000 in 1979 to 185/100,000 in 2008. These improvements have been attributed equally to high-tech invasive treatment, pharmaceutical innovation and behavior change (e.g., smoking cessation), all of which are due to research. Unfortunately, these national reductions in avoidable mortality are not evenly distributed across our country. We can all speculate on many reasons why that may be so. What if you knew that the volume and quality of biomedical, clinical, and population health research done locally had a direct impact on the quality of care delivered to you, your children or your parents? Zwicker and Emery from the School of Public Policy at the University of Calgary explain exactly that in their discussion paper, How is Funding Medical Research Better for Patients?, from August 2015. They compare provinces that have substantially invested in medical research (Alberta, British Columbia, Ontario and Quebec) with provinces that have not (Manitoba and Saskatchewan) and correlate that with reduction trends in mortality from potentially avoidable causes (MPAC). The results are disturbing. At one point they argue that in 2011 Alberta had 62.2 fewer deaths per 100,000 people from potentially avoidable causes than Saskatchewan. And they are able to correlate these variations in the trends for reduction of MPAC with the provincial investment in research across six provinces. They appropriately point out the limitations to their study and concede that rates such as MPAC are multifactorial. Much of the last 10-20 years in the world of health research has been preoccupied with the challenges of “translational research” and “implementation science.” These authors make an eloquent argument that local investment in research is an essential ingredient to the local adoption of health innovation and, in this case, reduction in mortality from potentially avoidable causes. I highly recommend you read it. And the next time you have a great health system outcome, also thank a researcher! As always, I welcome discussion and feedback. I have been at two remarkable meetings that have reinvigorated my faith in the profession of medicine. This past weekend I was at the meeting of the Canadian Society of Physician Leaders (CSPL) for the first time. This meeting, co-sponsored by the CSPL and the Canadian Medical Association (CMA), had an incredible line-up of leading academics and physicians focused on healthcare system transformation and the critical role of physicians in leading change. Key themes were that real change can only succeed with physician leadership, that we all have a role, and that leadership can be learned and developed. 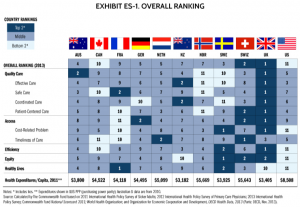 Another recurrent theme at practically every meeting I go to these days is that the Canadian healthcare system is among the worst in comparable western countries, given ours is one of the most expensive systems, yet challenged by poor performance and outcomes in quality, access, timeliness and safety. We are only exceeded by the USA for worst-place (see chart below, from The Commonwealth Fund 2014 Update: Mirror, Mirror on the Wall – How the Performance of the U.S. Health Care System Compares Internationally, by Karen Davis, Kristof Stremikis, David Squires, and Cathy Schoen). Despite intense effort in patient safety, adverse events have flat-lined at about 10 per cent in hospitals in our country, leading some to claim that healthcare system adverse events are third among leading causes of death. Sometimes I hear, “Why change?” If this is not a burning platform in healthcare, then what is? Saskatchewan was well-represented among about 500 attendees (including 75 students), including our own Dr. Dennis Kendel, CEO of saskdocs and one of the founders of the CSPL, who moderated a slightly tongue-in-cheek debate about politicians as the barrier to healthcare reform. One of our students, Paule Bertholet, was sponsored to attend by saskdocs. Thank you, Dennis! Tim Magwood, “Master Storyteller and Culture Catalyst” from Toronto, spoke about the links between leadership and innovation, while being an incredibly innovative entertainer at the same time. In one workshop, we were asked about our optimism that physicians would engage in and provide leadership to healthcare system transformation. I was in the glass-three-quarters-full part of the room. Despite some bad spots, such as the acrimony between the Ontario and Nova Scotia governments and their physicians, I see many physician organizations putting forward very progressive positions. This includes the CMA and the great changes led by former president Dr. Jeff Turnbull and subsequent presidents since, which are spreading across our country. Nowhere is this more evident than with our own Saskatchewan Medical Association (SMA), where we have had tremendous leadership by past-president, Dr. Mark Brown, current president, Dr. Intheran Pillay, CEO Bonnie Brossart, and her new leadership team. I attended the SMA’s Representative Assembly (RA) in Regina May 6-7 and provided an update on the College of Medicine. One of the themes of the RA was modernization of the health-care system. The proceedings included a panel discussion on the topic and an in-camera session where physicians grappled with challenges relating to making Saskatchewan the best place to practise medicine. In preparation for the RA, the SMA circulated a discussion paper titled The Future Physician Role in a Redesigned and Integrated Health System (scroll down in link to find the start of the paper), which I want to bring to your attention—it’s a remarkable paper, and was tabled and discussed at the meeting. This is incredibly important reading for everyone in the College of Medicine. You will see many of the same themes as at this past weekend’s CSPL meeting. The question at that CSPL workshop is very relevant. Are physicians able and willing to lead? It is important we all engage. I believe we are nearing the point of changing from horses to cars and the healthcare system of 2030 will look nothing like that of 2016. By the way, I would suggest you look up the CSPL or consider attending their meeting next year. Many of our faculty would already qualify for the Canadian Certified Physician Executive credential. As always, I encourage discussion and debate and would love to hear from you. I would be happy to meet with you and welcome invitations to department meetings or any other venue.